Buckle up and prepare to be blown away with a single seater driving experience. Without having friends in very high places, single seaters like the Formula F1000 and Formula Renault are the closest you can get to driving a fully fledged Formula 1 car track in the UK. These track cars more than hold their own, though, with the F1000 able to get from 0-100 mph in 4.75 seconds. That's quick. You'll be given professional instruction aswell as a number of sighting laps before heading out on your own for some alone time on the track. The perfect gift for any F1 fan. Available at multiple UK venues. See all available single seater experiences below. 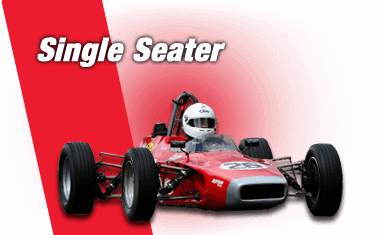 What is a Single Seater Driving Experience? Take to the track on a racing driving experience and be prepared for the staggering speed and acceleration of a single seater race car, similar to those used in F1. Not only will you experience the exhilaration of driving a high speed with the wind in your face and sitting inches from the floor, but also the g-force created when you power round high-speed corners. We offer a range of locations to enjoy the thrill of driving these amazing vehicles. Our Silverstone single seater gift vouchers are the perfect experience gifts for loved one, family members or anyone who is a fan of Formula One motor racing. Who can drive a single seater race car? Any of our single seater driving experiences are perfect for a motorsport enthusiast. There is no other way of driving a single seater unless you want to start up your own race team! Our single seater track days are the closest you can get to being that racing driver without a million pound chequebook. Some racing driving experiences do have age limits so please check this before you purchase your gift voucher or book a date.